Helen Rowland was born in Washington, DC in 1876. She attended the Emerson College of Oratory in Boston, graduating in 1895, whereupon she returned to Washington to further her desire to become an actress. She graduated from National School of Acting in Washington in 1896, but her father’s death made it necessary for Rowland to earn a living and she joined the staff of the Washington Post in 1899, where she worked until 1902. That same year she joined the New York Sunday Press, where she wrote “fiction, human-nature editorials, verse, and fairy stories for grownups.” Rowland married Gilbert Claude Lutz, a fellow journalist, in 1903, and worked as editor of the Gilbert Lutz Syndicate from 1903-1904. Helen, like George Cohan says: “I always leave ’em laughing when I say good-bye.” Rowland’s quotations of love and matrimony were compiled in half a dozen books between 1905 and 1927, the most popular being 1905’s Reflections of A Bachelor Girl. The average man looks on matrimony as a hitching post where he can tie a woman and leave her until he comes home nights. In marriage, the love-light so often goes out as soon as the gas bills begin to come in. Ennui is “that tired feeling” that a girl has when the right man doesn’t show up and the wrong one does. A rich girl need not bother to cultivate the art of conversation in order to be fascinating. Her money will do the talking. From the number of virtues and accomplishments that a man expects to find in one wife, you’d fancy he was marrying a harem. To a man, marriage means giving up four out of five of the chiffonier drawers; to a woman, giving up four out of five of her opinions. Good husbands are like tracts, comforting but uninteresting; the other kind are like dime novels, exciting, but apt to keep you in a constant fever of dread, anticipation and curiosity. In the love game nobody knows exactly what he wants; but a wise man tries to get what he thinks he wants and a wise woman tries to think she wants what she gets. Love is a sort of club sandwich affair, composed of large slices of selfishness, seasoned with passion, spiced with jealousy and covered with thin layers of sentiment. One whiff of an onion will do more to kill love than the breaking of the ten commandments. By the time a man has discovered that he is in love with a woman, she is usually so fagged out waiting for the phenomenon, that she is ready to topple right over into his arms from sheer exhaustion. Marriage is the miracle which affords a woman a chance to gratify her vanity, pacify her family, mortify her rivals, and electrify her friends, all at the same time. Marriage is sweet! Love is like appendicitis; you never know when nor how it is going to strike you—the only difference being that, after one attack of appendicitis, your curiosity is perfectly satisfied. True Love, in a born flirt, is evidenced by his inability to think of any other woman, while he is kissing a particular one. Flirtation is a duel in which the combatants cross lies, sighs and eyes—and the coolest heart wins. In order to be popular with men, in these days, a brunette must be either brilliant, interesting, rich or beautiful; but a blonde doesn’t have to be anything but a blonde. No doubt, even Solomon told each of his 700 wives that he had merely thought he loved the others, but that she was the only girl he “ever really cared for” in just that way. Never forget that marriage should be a privilege, not a prison; home a refectory, not a reformatory; and wives jolliers, and not jailers. Love, without faith, illusions and trust, is—Lord forgive us—cinders, ashes and dust! If married couples would show as much respect for one another’s personal liberty, habits and preferences as they do for one another’s toothbrushes, love’s young dream would not so often turn into a nightmare. It is the Siamese twin existence they impose on themselves that drives them to distraction or destruction. These are wonderful. And, an excellent source of ideas for novels! Where do you find books like this? @Mary Usually by accident on Google Books. 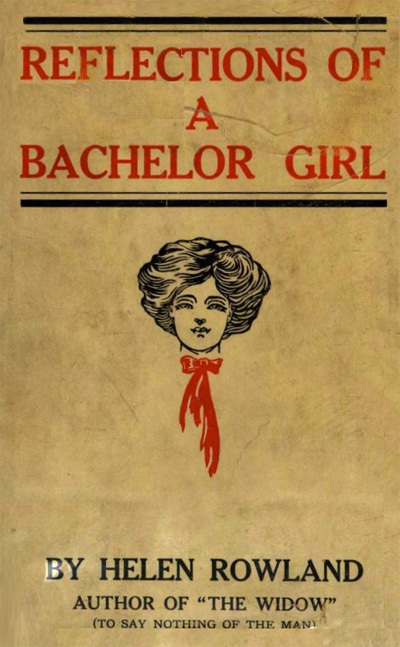 😉 A few years ago I stumbled upon the phrase “bachelor girl” and a search brought me to the Rowland book, among other articles about the topic.